View our current open career opportunities. View our 2018 Statement of Condition. Traditional Bank is not new to community banking. Our story begins in 1902 when two banks were formed in Mt. Sterling, Kentucky. In 1988 they merged, and that new bank would ultimately become known as Traditional Bank. Since the merger in 1988, all of the bank’s growth has been organic. We have not purchased any banks, but have instead grown through referrals from satisfied clients. And we think that says a lot about how we do business. We have always believed that people make the difference and that great service is what sets us apart. Today we couple those principles with a broader geographic reach, best in class commercial bankers and customer-focused technology so we can remain competitive while still giving our customers the personal banking experience they deserve. Our business is you. Two banks Traders National Bank and Montgomery National Bank formed in Mt. Sterling 30 days of one another. Two banks, Traders National Bank and Montgomery National Bank, formed in Mt. Sterling to become Traditional Bank. Traditional Bank opens two locations in Lexington and one in the Winchester market. Traditional Bank now has 13 branches, located in 5 counties and has grown to over $1.4 billion in assets. 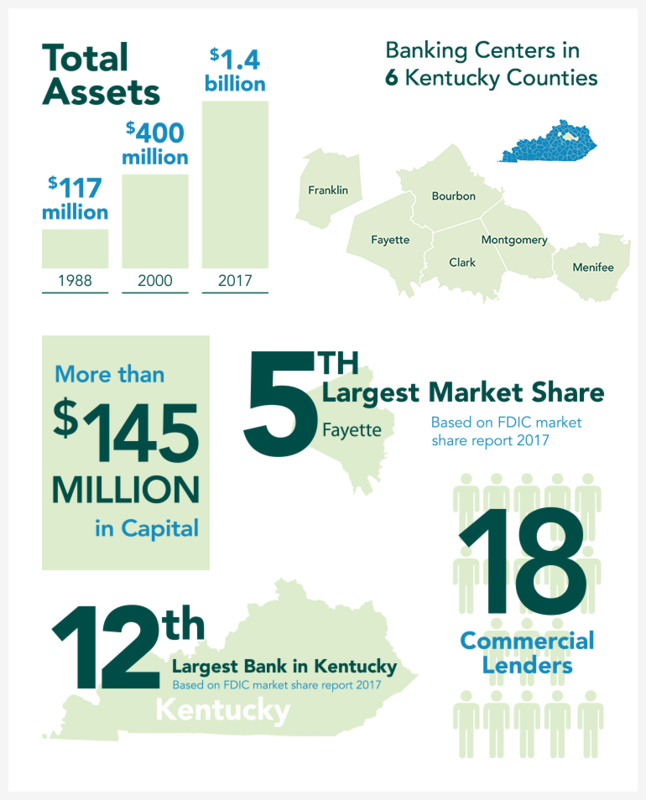 Traditional Bank opens second location in Paris and first in Frankfort market, growing to 15 branches in six counties. Deliver high quality service and products that meet or exceed the needs and expectations of our customer. Foster a work environment which encourages, recognizes and rewards employee development, teamwork, commitment and high performance. Be recognized as an active and responsible corporate citizen. Thereby, achieving quality growth and maximizing long-term value for our shareholders.